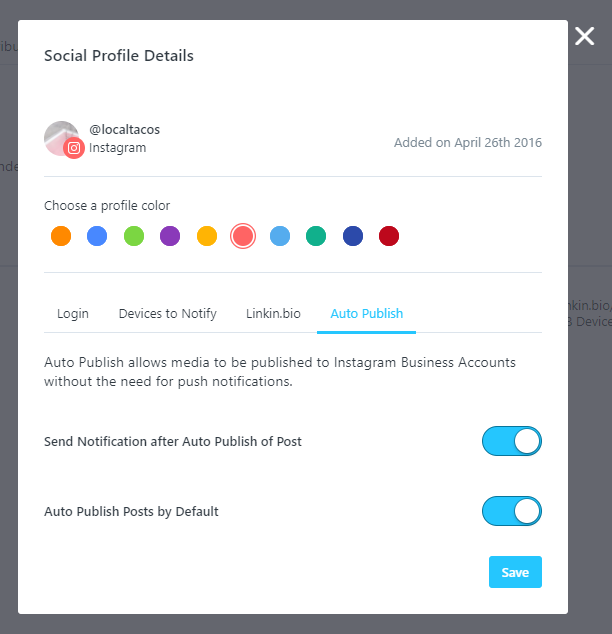 When you set up Auto Publish, the default is set to auto publishing; if you want to set the default to notification posts, you can do so from Later on the web. Head to Settings, then Social Profiles & Groups, and find the group that contains your Instagram profile that you'd like to change the default for. Click on the Instagram profile to open up the settings for that profile. From here, click Auto Publish. Toggle Auto Publish Posts by Default to off, and remember to hit Save so that your choice is saved! Now your new posts will default to Notifications, regardless of type of post! Tip: You can still change individual posts to be auto published during post creation -- simply change 'Notification' in the bottom right to say 'Auto'.